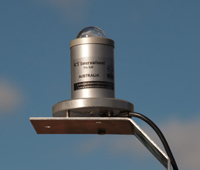 The SK01-D2 is a simple Pyranometer with Silicon Photodiode Sensor with precision amplifier for measuring total solar global radiation on a horizontal surface. Glass dome to keep debris off the cosine corrected diffuser. Hard anodized aluminum for corrosion resistance. The SK01-D2 supplied with 3 meter cable with suitable interface for Data collection on ICT International VSL DataLogger . The Middleton SK08 is a solar radiometer for the accurate measurement of global irradiance on a plane surface. It exceeds the international accepted specifications for a good quality Pyranometer. The SK08-E version has an inbuilt signal amplifier. A passive thermoelectric (Thermopile) sensor , optimized for thermal stability. Fast response and Strong output signal. Aluminium construction, hard anodized for corrosion resistance. Fully Sealed for low maintenance. Economical good quality measurements for weather station, network monitoring , climate control and radiation monitoring in the field condition. The SK08 or SK08-E supplied with 3 Meter cable and suitable interface for ICT International VSL Datalogger. The Middleton CN1-R Net Pyrradimeter measures the net total radiation flux (solar, terrestrial, and atmospheric) downward and upward through a horizontal surface. It is suitable for solar energy studies in agriculture and meteorology. Excellent directional réponse, stable durable . Marine grade Aluminium hard anodized for corrosion resistance. The EQ08 Pyranometer supplied with 6 meter cable and suitable interface for ICT VSL Datalogger .Supplied with simple mounting Kit. The Middleton EQ08-S is a precision Pyranometer for the measurement of global solar irradiance on a plane surface. 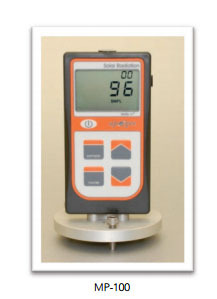 It exceeds the international accepted specifications for a high quality Pyranometer. The EQ08-S incorporates a unique thermoelectric ( Thermopile ) sensor that has exceptionally low directional error without compromise to signal strength or response time. The EQ08-E version has an inbuilt amplifier to give a millivolt output for easy signal measurement. - An unique thermoelectric (Thermopile) sensor, optimized for thermal stability. - Fully sealed construction for low maintenance. Datalogger .Supplied with simple mounting Kit. 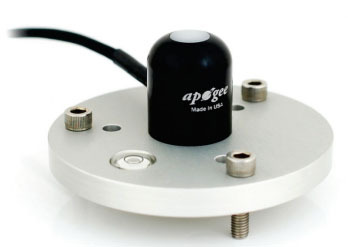 Apogee Instruments pyranometers represent the next generation in pyranometer design maximizing accuracy, reliability and durability. Featuring a silicon-cell photodiode with excellent cosine response, our pyranometers measure total solar radiation to within ±5% at a fraction of the price of black-body pyranometers, and at a far lower price-point than most other photodiode pyranometers on the market due to advancements in manufacturing.